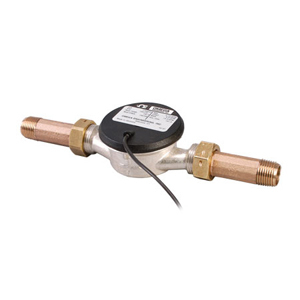 Designed for long-term water billing applications, the FTB4600 series of flowmeters are highly accurate and feature a high frequency pulse output suitable for remote flowrate indication or flow totalization. For economy, they have no local indication of the flowrate or total. The pulse output is compatible with OMEGA’s DPF400 and DPF700 series ratemeter/totalizers. All meters include built-in strainers, locking nuts, gaskets, coupling pieces, and 1.5 m (5') of 3-conductor copper wire. Pulse Output: Requires 6 to 16 Vdc @ 10 mA max. power; output requires pull-up to positive dc voltage. Includes 1.5 m (5') of cable. 참고: Comes complete with built-in strainers, locking nuts, gaskets, coupling pieces, 5’ (1.5 m) cable, and operator’s manual.